What is the Investor Stewardship Group (ISG)? The Investor Stewardship Group (ISG) is one of the world’s largest investor-led efforts to develop a structure for both corporate governance and investment stewardship for a specific market. Its membership includes some of the largest U.S.-based institutional investors and global asset managers, along with several of their international counterparts. The members include more than 60 U.S. and international institutional investors with combined assets in excess of US$31 trillion in the U.S. equity markets. The ISG is led by each member’s senior corporate governance practitioners. The professional experience of our members’ over a number of years has shown that good corporate governance and responsible stewardship are fundamental to creating long-term value for U.S. companies and the broader U.S. economy. The ISG was formed to bring all types of investors together to enable them to speak with one voice on fundamental issues of corporate governance and investment stewardship. The result is a framework consisting of a set of stewardship principles for institutional investors and corporate governance principles for U.S. listed companies. How is the ISG governed? The Steering Committee – primary policy and decision making body of the ISG. The Governance Committee – responsible for developing and updating governance structures, policies, and practices. The Marketing and Communications Committee – responsible for executing the strategic communications plan of the ISG and coordinating meetings of the membership. All ISG members have been invited to join the Governance and Marketing & Communications Committees, although joining a committee is entirely optional. After one year of engaged and active committee service, a member will be eligible to join the Steering Committee. Which members are currently governing the ISG? The founding members of the ISG are the initial members of the Steering Committee, the Governance Committee and the Marketing and Communications Committee. As noted above, all ISG members have been invited to join the Governance and Marketing & Communications Committees. 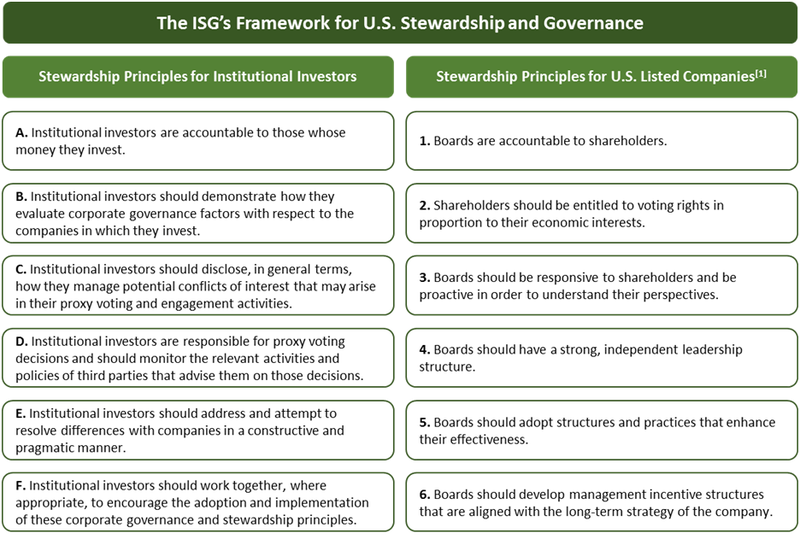 What is the purpose of ISG’s Framework for U.S. Stewardship and Governance? Codifies the fundamentals of good corporate governance and establishes baseline expectations for U.S. corporations and their institutional shareholders. Outlines the commitment to accountability made by participatinginstitutional investors to their clients/beneficiaries and articulates standards that investors will consider when evaluating the companies in which they invest. Affirms investment managers’ responsibility for engagement and proxy voting policies and decisions, regardless of how they may use services offered by third parties. What are the principles that make up the Framework? When did the Framework go into effect? The Framework became effective on January 1, 2018. Beginning with the 2018 proxy season, ISG signatories are encouraging U.S. listed companies to articulate how their governance structures and practices align with the ISG’s Corporate Governance Principles. If they are not aligned, companies should explain how their approach differs and the rationale for any difference. ISG signatories believe companies can best decide on how and where to disclose their alignment with the Principles, for example, through investor relations, boards of directors or corporate governance websites, or in other investor outreach/engagement materials. Are investors and companies required to strictly adhere to the Framework? By signing onto or endorsing the framework, institutional investors have adopted these practices with respect to proxy voting and engagement guidelines and practices. We encourage shareholders’ elected representatives — company directors — to apply the Corporate Governance Principles at the companies on whose boards they serve. However, the Framework is not intended to be prescriptive or exhaustive and companies and investors should apply it in a manner they deem appropriate. In fact, many of our members have higher standards than those contained in the Framework. To assist in the understanding and implementation of these principles, we have provided the rationale and expectations that underpin each principle. Will the Framework be updated or amended over time? If so, when? The ISG Framework is designed to codify basic governance and stewardship norms for public companies and their institutional investors. The ISG does not anticipate frequent amendments to the Framework, however it believes it should be evaluated periodically and amended to the extent that commonly accepted governance and stewardship norms evolve over time. The ISG, under the leadership of the Steering and Governance Committees, has adopted an Amendment Process that permits all members to participate in the evolution of the Framework. Click here to the review the Amendment Process. What is the difference between a Signatory and an Endorser? U.S. and International investors who already have a set of corporate governance and stewardship principles aligned with the Framework can become signatories. Investors who may not already have a set of corporate governance and stewardship principles can also sign the Framework and adopt its principles as their policy guidelines. International investors that are governed by home-country governance or stewardship principles, or who have signed corporate governance or stewardship codes in other jurisdictions that may be inconsistent with the Framework, can endorse the Framework to demonstrate their support for these US-specific corporate governance and stewardship principles. As an asset manager or owner, how can I join the ISG to support the Framework? We invite all asset managers and asset owners investing in the U.S. capital markets to join us in this historic effort by signing onto or endorsing the Framework. Simply visit www.isgframework.org/join-isg. As a U.S. listed public company, what can I do to support the Framework? We encourage all companies to articulate and disclose how their governance structures and practices align with the Framework as well as whether and why they differ in approach. The ISG is a voluntary group but members are expected ensure that their policies and practices meet or exceed the principles contained in the Framework. Members should periodically review their governance and stewardship policies to ensure that they remain consistent with the Framework. Do ISG members speak on behalf of other members or represent ISG’s views as a whole on matters related to individual, U.S.-listed companies? As a signatory or endorser of the ISG Framework, members have specifically agreed to the six corporate governance principles and six stewardship principles outlined above. Each investor member of ISG has adopted proxy voting and engagement practices that are in line with the Framework. However, investor members may have different positions with respect to any particular companies’ governance practices or other general matters of governance. Accordingly, no member is authorized to speak on behalf of any other member or the ISG membership generally. Do ISG members currently engage collaboratively with U.S. companies, or are there plans to do so in the future? Investor members of ISG who engage with U.S. listed companies do so on their own behalf and in accordance with their own engagement policies. Members are not permitted to state or imply that such engagement is supported by other investors by virtue of their common membership in ISG. At the present time, it is not ISG’s intention to allow or facilitate collaborative engagement for its members. Which asset managers and asset owners are members of the ISG? Click here to see the list of the ISG’s Signatories and Endorsers. Where can I direct specific questions? Email your specific queries to info@isgframework.org and someone will be in contact with you.